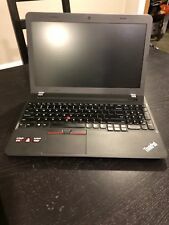 LENOVO THINKPAD E555, AMD 10 1.9GHZ, 8GB, 240GB SSD, AMD Radeon R7 M260DX Gfx. Condition is Used. Shipped with USPS Priority Mail. (1.7GHz, 8GB) Laptop Computer. The Laptop is used but shows only light wear and it works perfectly fine. Its a pretty powerful laptop with touchscreen. The screen is very clear and you can use it as a tablet with the touchscreen functionality. I have had this laptop recently inspected by a technician. Condition is Used. A few minor scratches on top. N o falls, no spills, one owner. • (1) - GEFORCE GT 635M (INTERNAL GRAPHICS). • (1) - HP ENVY DV6 15.6" 1920X1080 LAPTOP DV6T-7300. • (1) - 1TB HDD HARD DISK DRIVE STORAGE. None of these issues affect the Laptop's functionality. The touch screen of laptop will randomly press and/or scoll to the top or bottom of a page and is currently disabled. OS-Windows 10. Sleep Function. 4200U (1.60 GHz). 4-cell lithium ion. Input Device. 802.11a/b/g/n Wireless LAN. Hard Drives. Integrated Card. Graphic Type. Windows 8.1 64-Bit. Dell Inspiron 3531,15.6" 2.16GHz, 4GB 500GB, Win8.1+Ubuntu+Android, Office! Libre Office - free, open source Office suite compatible with Microsoft Office. Installed in Windows and Ubuntu! Dell Inspiron 3531 - specs Triple boot system: Ubuntu Linux, Android, and Windows 8.1. Barely used laptop, in excellent condition, only used once on a trip to Asia. ColorMatte Black. RAM6 GB DDR3 SDRAM. Item model numberX555LA-SI50203H. 500GB Hard Disk Drive, 8GB RAM,DVDRW. Super-Multi DVDRW. WiFi, WebCam, USB 3.0. 8GB INSTALLED ! DDR3L 1600 MHz SDRAM. ASUS - X550LA - 15.6" Powerful Laptop. ASUS X550LA Detailed Specifications:-. But as always with any system minor wear might be present including minor scratches on bottom and top cover. This is a used Dell Inspiron 15 Core i3. O 256GB SSD. o Grade C. o Wifi Bluetooth (issue with Bluetooth, see above). · Item Condition. o Laptop only. Condition is Used. It is in very good condition. Everything works fine. I bought this laptop about 2 weeks ago and I really enjoy but I wanna sell it so I can get some money to help my mom that's in the hospital if you guys would love to help please do. Infused with the spirit of the ultimate Force (TUF) and designed to strike fear into the heart of the enemy, The durable and lightweight FX504 is the first laptop in the TUF Gaming family. FX504 uses high-frequency DDR4 2666MHz RAM and solid state Drive and/or Seagate Firecuda solid State Hybrid Drive to ensure smooth performance. From United StatesType: Notebook/LaptopBrand: ASUSProcessor: Intel Core i5 8th Gen.
Hard Drive : 500GB HD. This laptop is inexcellent working order. It has been fully tested and it works great! Built in Headphone Jack. Built in Optical Drive. Does this laptop have a back-lit keyboard?NO. Checkout before your order will be cancelled. "Sold AS PICTURED". Puerto Rico or Virgin Islands. Infused with the spirit of The Ultimate Force (TUF) and designed to strike fear into the heart of the enemy, the durable and lightweight FX504 is the first laptop in the TUF Gaming family. FX504 uses high-frequency DDR4 2666MHz RAM and a Solid State Drive to ensure smooth performance. Lightly used toshiba, minimal scratching (only on the outer top), screen in perfect condition, cleared and reset to factory settings. Targus - Debossed Laptop Sleeve - Gray/Black. Logitech - M185 Wireless Optical Mouse – Gray. Integrated 1.0 MP Webcam & Microphone. ASUS X551CA-HCL1201L Laptop. Bundle Includes 500GB hard drive for serviceable file storage space. Acer Gateway NV570P25U 15.6" HD Touchscreen Notebook - Lithium Ion Battery - AC Adapter - Acer 1 Year Warranty. You can tap, swipe and gesture your way across the web. Processor Type Core i5. Hard Drive Capacity 500GB. AMD A6-5350M Processor. AMD Radeon™ HD 8570M 2GB VRAM. 15.6" HD Antiglare (1366 x 768) Display. HD Webcam (front-facing). We will reply you with 24 hours. Weight: 5.4 LBs. AC adapter included. Bluetooth included. ASUS Vivobook S500CA 15.6" Touchscreen Core i3, 8GB 500GB Windows 10 Nice! This laptop is in like new condition, no scratches no dings. 500GB 5400 RPM. 19 V DC, 1.73 A, 33 W. We will always do our best to resolve the issues as fast as possible. 100 -240 V AC, 50/60 Hz universal. 4.7 lbs (with 3 cell battery). Power Adapter. 3Cells 3000 mAh 33 Whrs. Storage 500GB. RAM 8GB DDR3 RAM. Processor AMD A8-6410 2.0GHz. AC Adapter 3rd PARTY ADAPTER. Fully tested and functional. If we are unable to verify your order; your order may be cancelled. Loc: J1 LID: PW.